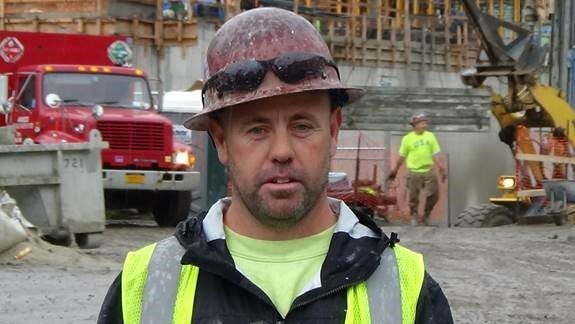 Barry O’Brien is a member of the LIUNA Local 18A Cement and Concrete Workers. He is currently working on the Riverside Drive project in New York City, a 100% union-built property located along the Hudson River in the Upper West Side of Manhattan. The AFL-CIO Building Investment Trust (BIT) is an equity partner in the construction of the $420 million development project that Barry is helping to build. It will stand over 40 stories tall, totaling nearly 750,000 square feet. It will include approximately 590 apartments, with 80% of the units priced at market rate and 20% as affordable units. The building will also include retail space, unique access to green space, and a New York City public school that will be constructed on the first five floors. In addition to Riverside, the AFL-CIO BIT has eight other projects currently in development across the country. Total development cost for these projects is approximately $1 billion, and they are expected to create some 5,000 union jobs throughout the course of construction. That means roughly 10 million union construction hours are currently underway, and more jobs will be created once these projects are complete. Over the past 26-year history of the program, since beginning operations in 1988, BIT has invested $5.5 billion for the development and acquisition of more than 180 office, retail, multifamily, hotel, warehouse, and mixed-use properties across the country.